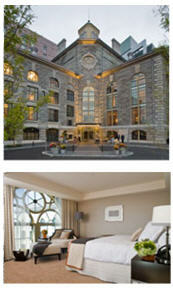 We are pleased to offer discounted hotel rates at the new Liberty Hotel and the Boston Marriott Cambridge. NOTE: Complimentary shuttle service to the conference site will be provided from the Liberty Hotel. This brand-new hotel is a national historic landmark at the foot of Beacon Hill, with spectacular views of the Charles River and Boston skyline. The Liberty Hotel offers a quick jump over the Longfellow Bridge to Cambridge, as well as a perfect location to explore all that downtown Boston has to offer. $299.00 per night (single/double occupancy). If you would like to extend your stay, please inquire about pre- and post-conference packages. To book a room at the Liberty Hotel, please call the hotel reservation line at 866-507-5245 and mention the EmTech@MIT conference. To learn more about the hotel, please click here. MIT is located on the north shore of the Charles River Basin in Cambridge, MA, USA. The campus is within 3 miles of two major interstate highways and less than 6 miles from a major international airport; it is accessible via public transportation. MIT is a 15-30 minute walk from downtown Boston (depending on the weather). MIT is a 30-40 minute walk from Harvard University , which is located just up the river from MIT. MBTA ("The T") Subway - Take the Red Line subway to the Kendall/MIT Station or to the Central Square Station, both of which are a short walk from campus. The walk from Central Square takes about 10 minutes and takes you right down Massachusetts Avenue. The Kendall/MIT Station is on the eastern side of campus, about a 15 minute walk from the conference site. Most of the walk is inside MIT buildings. Bus - The #1 or Dudley/Harvard Station bus stops at MIT on Massachusetts Avenue and provides transportation to Central Square and Harvard Square (Northbound), and Boston (Southbound). The MIT stop is at a large crosswalk with a stoplight. On one side of the street are steps leading up to large Ionic columns and the Small Dome of MIT; on the other side of the street is the Stratton Student Center and Kresge Oval (an open, grass-covered area). Additionally, the CT1 (Crosstown bus) stops at the MIT stop on Massachusetts Avenue and the CT2 bus stops on the corner of Massachusetts Avenue and Vassar St. as well as Kendall Square T Station. By People’s Choice Transportation: We have also arranged for pre-paid shuttle vouchers available for purchase for $16 (Boston) or $22 (Cambridge) per person (one way). You can purchase these directly through People Choice by emailing shuttleboston@yahoo.com or calling 617-861-1407 or 617-746-9909. By Taxi - Taxi fare from the airport is about $20-$25. During non-rush hour, the taxi ride will take about 15 minutes. During rush hour, the ride could take 30 minutes. By Subway - From any terminal at Logan Airport, take the Silver Line bus to South Station. At South Station, change to the Red Line subway to Kendall/MIT (inbound toward Alewife). Under normal conditions the ride will take about 30 minutes; the fare is $1.70. By Car - Leaving the airport, follow the signs to the Sumner Tunnel. Enter the tunnel and stay in the right lane. At the end of the tunnel, continue to stay in the right lane, start down an incline and bear to the right immediately at the sign for Storrow Drive. Take Exit 26 for Cambridge/Somerville. Follow the signs for Back Bay/Cambridge (do not take the exit for Cambridge/Somerville). Stay in the right lane and follow the signs for Storrow Drive Westbound. After you pass under the pedestrian walkbridges, change to the left lane and take the exit for 2A North. Turn right and cross the Harvard Bridge (Massachusetts Avenue). Kresge Auditorium and the Student Center are on the left at the second set of traffic lights. If you are heading south on I-93, follow I-93 into Boston then follow the I-93 instructions below. If you are heading south on I-95, take the I-93 South exit (exit 37) then follow the instructions from I-93. Alternatively, take the I-90 East exit (Massachusetts Turnpike) from I-95 then follow the instructions from I-90. If you are heading north on I-93, follow I-93 into Boston then follow the I-93 instructions below. If you are heading north on I-95, take the I-93 North exit then follow the instructions from I-93. Alternatively, take the I-90 East exit from I-95 then follow the instructions from I-90. Follow I-90 east to the Cambridge/Brighton exit (exit 18). Following the signs to Cambridge, cross the River Street Bridge, and continue straight about 1 mile to Central Square. Turn right onto Massachusetts Avenue and follow Massachusetts Avenue for about a half mile. Kresge Auditorium and the Student Center will be on your right. If you cross the river again, you have gone too far. From I-93, take exit 26, and follow the signs to Back Bay along Storrow Drive West, approximately 1.5 miles, to the exit for Route 2A. The exit will be on the left, just before the Harvard Bridge (more appropriately called the Massachusetts Avenue Bridge). The Charles River will be on your right. As you cross the bridge, you will be looking at MIT - the Great Dome and academic facilities are on the right, Kresge Auditorium and the Student Center are on the left. MapQuest offers excellent mapping services, including very specific directions from anywhere in North America. Use the address " 77 Massachusetts Avenue, Cambridge, MA 02139 " for general directions to MIT. The MIT campus map will give you walking directions to Kresge Auditorium. Parking in Cambridge and Boston is generally not an enjoyable experience. Whenever possible, park your car at the hotel at which you are staying and use public transportation to get to the MIT campus. If you must drive to the campus, there is both on- and off-street parking available, but most public parking is not very close to the center of the MIT campus (unless you arrive early in the morning or late in the evening). There is metered parking on Massachusetts Avenue for short stays and evenings/weekends, as well as a number of lots at which you may park for a fee. These include Vassar St. Public Parking at the corner of Massachusetts Avenue and Vassar Street, University Park / Star Market Public Parking, and Marriott Parking Garage on Ames St. and Broadway. Shuttle service to MIT will be provided from hotels as needed. You will be given a schedule upon check-in. EmTech welcomes international attendees! In 2009, we hosted attendees from 26 different countries. If you are traveling from overseas and require a Letter of Invitation in order to process your visa, please click here.